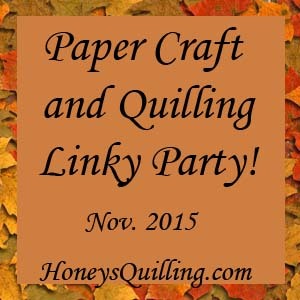 Paper Craft Linky Party for November! Welcome to Honey’s Quilling November Paper Craft Linky Party! A couple weeks ago I was browsing around craft blogs and I found some fun Halloween linky (linkup) parties to join. If you don’t know what a linky party is, it’s where you, and other bloggers, are able to share your posts so that everyone can easily see them, visit them, etc. It’s a great way to convey a sense of community among bloggers as well as to find new followers! I enjoy joining in linky parties on other blogs when I can. What I have not seen is a dedicated linky party for paper quilling and other paper crafts. So I thought I’d try it out! So if you are a blogger who has any craft posts involving paper crafts of any sort (paper quilling, cardmaking, origami, scrapbooking, decoupage, etc. then here is the place to share them! It is a great way for us all to “meet” each other, find new blogs to read, and new projects to do. I will choose some of my favorite project links to post on pinterest, facebook, and twitter. Share the party! Share this post on facebook, twitter, pinterest, etc. The more the better, but be sure to share in at least one place. Visit and leave a comment for at least 2 other people in the Linky. Follow Honey’s Quilling on Facebook, Twitter, Pinterest, and/or Google Plus. You can link up to 3 of your posts – old and new posts are welcome. Your post must feature some sort of paper quilling or other paper craft. Grab this button and add it to your blog (in a post or sidebar) with a link back to this post to help invite more people to the party! After you join the linkup, don’t go away, there is lots to see here on the blog! Woww soo excited.thanks for the party! !